Industrial-inspired design meets intuitive smart heating in the Terma Ribbon V E vertical designer electric radiator - adding a contemporary flavour to a range of different spaces. Using either an Android or iOS device, interact with your heating from the palm of your hand, without the need for any manual adjustments. These versions of the Ribbon come finished in black for daringly bold statement heating. Download or view the Terma radiator manual, Ribbon assembly instructions, and element manual here. Terma Ribbon electric radiators are rated IPX5 and must always be installed by a professional electrician, no matter whether it’s for use in bathrooms or in any other areas of the home – they are not supplied with a plug for this very reason. For further installation information, please see the mounting guide and product dimensions. Always defer to the manufacturer’s guidelines about the bathroom suitability of any product. All Terma Ribbon radiators come with an 8 Year Manufacturer’s Warranty on the radiator body and a separate 2 Year Manufacturer’s Warranty on the electronic heating element. This non-stocked, bespoke product comes directly from the manufacturer and is available with free delivery. Please allow 4 weeks for this item to arrive. Due to the fact it is custom made, this item is non-refundable unless damaged. 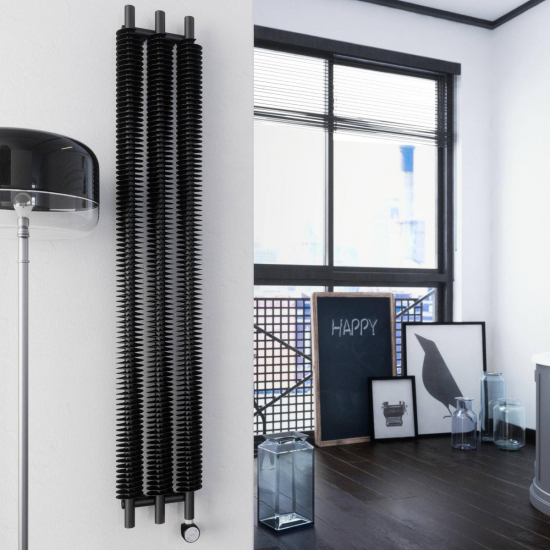 The Terma Ribbon Designer Electric Radiator perfectly blends contemporary style and advanced technological control to provide an effective heating solution for all modern households. Their swirling, screw-like vertical design allows them to act as a striking room feature as well as a source of comfortable heat for your home. Vertical radiators can be used to create an attractive focal point but are also an excellent practical choice for rooms with an unusual layout or limited wall space. Terma Ribbon Designer Electric Radiators are available in copper, black and grey finishes to add a dash of industrial elegance to any contemporary space. One of the most impressive features of the Terma Ribbon is its cutting-edge Terma MOA Blue heating element, which offers a level of control on a par with some of our most advanced electric heating systems. Using the Terma BlueLine heating app and a Bluetooth enabled mobile device, you can adjust your radiator’s heat levels from your phone or tablet with ease and even create a custom 7-day heating schedule. If you don't want to use a mobile device to control the Terma Ribbon, the heating element also includes a simple, push-button interface which allows the heater’s output to be increased or decreased incrementally between 1 – 5 stages. The MOA Blue element incorporates a host of other useful functions to make your Terma Ribbon convenient and easy to use. If you only want to use the Ribbon for a short period of time, you can make use of its convenient timer function. This feature allows the radiator to warm for a 2-hour restricted period, after which it will switch off automatically. An anti-frost mode is also included, which will activate when ambient temperatures fall between 5 – 7 °C to prevent pipes from freezing. A temperature sensor in the MOA Blue element limits the maximum operating temperature to 60 °C. As an additional safeguard against overheating, the heating rod also includes a fuse which will cut power to the radiator if it exceeds a temperature of 82 °C. The Terma Ribbon Designer Electric Radiator has an IPX5 protection rating, making it suitable for installation in bathrooms, provided it is hardwired by a professional electrician. Please note: The Terma Ribbon V E Vertical Designer Electric Radiator is part of our range of bespoke, non-stocked products and comes directly from the manufacturer. Due to the fact it is custom made, this item is non-refundable unless damaged.